The Portfolio Performance Monitoring model enables the ongoing monitoring and periodic valuation of a portfolio of financial investments. The model allows the entering of investment transactions during a reporting period to calculate performance. Furthermore, incremental investment transactions undertaken during a period are fully accounted for in the period's performance calculations. Roll over of the model and archiving of transactions make this model ideal for monitoring your portfolio on an ongoing basis. Accurate handling of distributions, investments and divestment to calculate returns. Rollover option to reset the model for a new reporting period. Graphical display of historical portfolio performance snapshots. Compatible with all versions of Excel for Windows as well as Excel for Mac as a cross platform portfolio tracking and management solution. 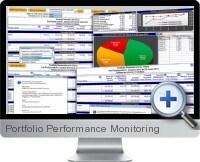 More resources for the Portfolio Performance Monitoring template including video, user manual and support can be found on the Excel Portfolio Performance Monitoring Template page. I have a variety of investments in different accounts and this Excel sheet is very helpful to get a good overview of the combined investments. Very good layout and easy to use. Superb spreadsheet. I was looking for something that I could just download and use without much effort on my part. The Portfolio Tracker is the perfect solution for this. I have an Investment account that is not performing well as it is hard to track the number of holdings in my account. It is very time consuming to go through 40 holdings to track their progress on a monthly basis. With Business Spreadsheet's Portfolio Performance Tracking software I am able to track my investments and sell the losers and add to the winners as I'm provided an up-to-date gain or loss of an individual holdings which allows me to decide immediately what, if any, action is warranted. Using this software I am able to make more decisions that are appropriate for my risk tolerance. The portfolio performance tracking tool is suitable for individual investors that trade in generic asset classes and instruments. For high volume traders with more eccentric instruments and asset classes, a more sophisticated or customized tool may be required. This is a very fine product. Previously I was making my own performance tracking templates and had numerous versions, making life challenging. This product has improved my productivity.